The Eighteenth Judicial District Commission on Judicial Performance unanimously recommends that Judge Paul A. King BE RETAINED. Judge King earned a bachelor’s degree from Bradley University in Peoria, Illinois, in December 1974. He graduated from the University of Denver College of Law in June 1978. Prior to his appointment to the bench, Judge King served as a Deputy District Attorney in the 18th Judicial District Attorney's Office; he later became the Chief Deputy District Attorney in Douglas County where he prosecuted major felony cases. He was appointed to the district court bench in 2000 where his current caseload is 50% criminal, 40% civil, and 10% juvenile matters. Judge King is currently the Presiding District Court Judge in Douglas County. Judge King believes strongly in community service and feels that community involvement is important for judicial officers. To him, it is important for others to know that judges are part of the community and not above it. Judge King has participated for many years in the Colorado High School Mock Trial Tournament, serving as a judge for the mock trials conducted by high school students from Douglas County. Through the University of Denver College of Law he also mentors a first year law student. Judge King currently serves on the Board of Directors of the Colorado Lutheran High School Association and supports the Sky Cliff Stroke Center in Castle Rock. He regularly donates blood in blood drives for Children's Hospital and, through his church, has worked on Habitat for Humanity projects. When his children were younger, Judge King was actively involved in their activities, coaching youth sports and participating in church activities with them. When they went to high school he assisted at the school concession stand at athletic events and generally supported the school. 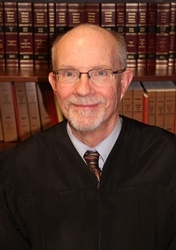 Before recommending retention of Judge King, the Commission conducted extensive research, including meeting personally with him, reviewing surveys conducted on the judge, interviewing people involved in the courtroom, studying Judge King’s personal self-evaluation and rulings, and conducting personal observations in the courtroom. Surveys praise his judicial decorum, describing him as an outstanding jurist; intelligent, consistent, courteous and well-prepared. Among the survey questions was, "how strongly do you recommend that Judge King be retained in office?" Of the attorneys responding to the survey, 92% recommended to retain, 0% not to retain, and 8% made no recommendation regarding retention. Of the non-attorneys responding to the survey, 94% recommended to retain, 2% not to retain, and 4% made no recommendation regarding retention. The Commission finds that Judge King is an exceptional and accomplished judge who should be retained in office.